Our friend from St. Mary’s has updated us on the progress of their experiment. Best to just quote what he said. The research report has been submitted as a senior thesis and is on file in our library. I am planning to add a Marine microcosm sustainability page to my web site and I will upload the complete study to that page as well as an annotated the version for a general (but marine aquarium savy) audience as well as the abstract of the study abstract. St Mary’s College is proud of their “Green campus ” awards so the page will focus on “Sustainable Science” from the viewpoint of natural resources (the reefs) materials (the actual microcosm) and energy usage. The soft corls (Sarcophyton) show no statisticaly significant difference with respect to the light source. The paper explains how this may result from the difficulty in obtaining reproucible samples. 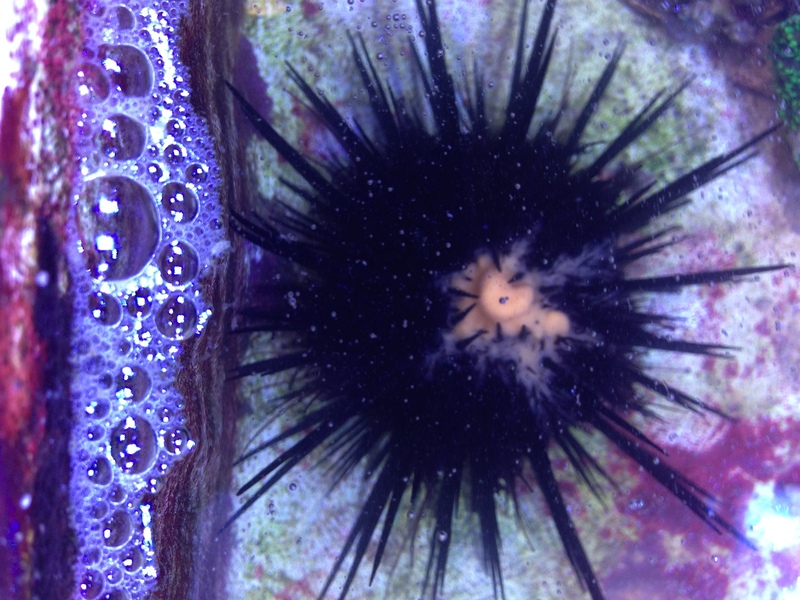 The Zooanthid (Playthoa) and hard coral (Galaxia) however did show statissticaly significant improvement in growth of the coral ans well as the zooxanthallae count and chlorophyl content. Above is the Thesis and Abstract of the experiment done by Dr. Hatch’s students. They specifically look at three different lighting types and compared growth. There was significant difference between the variables! These studies will be linked to from this blog as soon as they are received! My opinion, which is in no way the end all for the reasoning of this experiment. Dr. Hatch came to know the LEDs he choose for this experiment, by understanding the TMC AquaRay LED line is a brand advertising, they use less watts to get quality growing energy. Some claims, is that there will be more growth, because the spectrum in the fixture are selective, licensed, and patented. As a base line, even if these 30 watt fixtures can go the same as another 120 watt LED, or 250 watt MH… The fixture is doing it with only 30 watts. The statement can be made, watt per watt, for LEDs available to date, these LEDs have the most useful amount of energy. As in, growth was increased compared to VHO and MH at only 30 watts of quality light spectrum. Was this experiment testing LEDs compared to other LEDs… No. There’s really no need for this study as there are so many variables (different spectrum and amount of spectrum) which can affect the experiment. There’s no benefit for someone running a large LED study like this. 120 watts LEDs could have been included in the experiment to add another variable, but there are so many combinations of 120 watt fixture, some included user features like dimming, so what would it really proved? How are these fixtures different? It’s in the way they drive the energy from the fixture. Emitter didoes can be designed to be under driven or driven at a certain voltage. Many 120 fixtures use many emitters and under drive them. Some less watt fixtures drive their emitters at a higher voltage, but use less emitters. What this study does shed light too, is that even with 30 watts of high output LEDs (of known useful growth spectrum, not color spectrum), growth will be better than VHO and MH. Certain corals at that (interesting how it’s the “higher light” requiring corals at that, not the soft corals, known for requiring less light. Growth maxed out?) As all different species of plants and corals, could grow different under different spectrum or require different amounts of light. 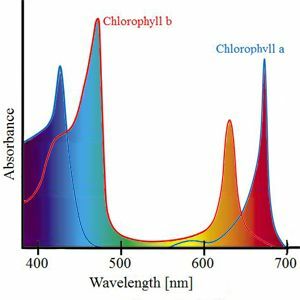 The spectrum being provided for this experiment, was focused on Chlorophyll Synthesis of Chlorophyll A & B. Color was a moot point as it was not the focus of the study. Even though, color was not an issue, which we can see from pictures. So, with 30 watts of high powered LEDs, great color is still present, which many people question. Great job Dr. Hatch and students. Looking forward to the journal review of the experiment. This experiment is close to two weeks from being completed. As the results are still coming in, here is the update we do have based on observation. It is very clear that over all growth was enhanced by TMC Ocean blues. We are processing zooxantheallae counts, total protein analysis, total chlorophyll etc through stats now. An interesting aside: Late in the afternoon of the 19-21 (New moon) Most of the Galaxia under LED illumination spawned (several hundred colonies). The water was nearly opaque with gametes down current from the coral. Both the eggs and sperm were viable and fertilization resulted in viable embryos although I only followed the development of a few to the 8 and 16 cell stage. More will come of this experiment. This is exciting work done at St. Mary’s College of Maryland. Hopefully, this study will give some real proof to what LEDs can do. 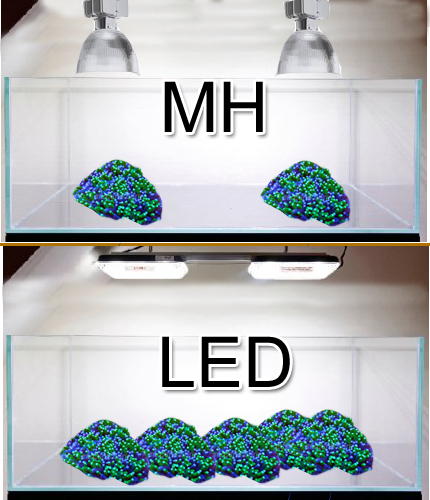 Many people switch to LEDs from MH or other and they may see a difference. But very few people are running controlled tests such as this. The most likely reason, this spawning reaction is happening for the corals under LEDs, is due to the more USEFUL light LEDs provide. Even more so for the TMC AquaRay LEDs, as they have the most ‘useful’ light per LEDs available to the hobby to date. 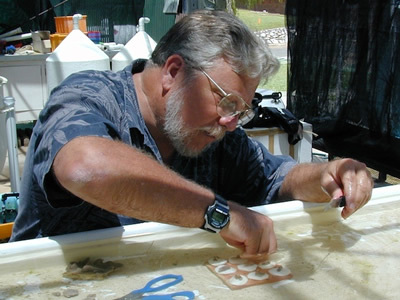 Here is the latest on the LED marine coral experiment. We will keep a photographic record of the light comparisons, but it is unlikely that they will show growth differences in only a month (maybe 2). The corals will have changed color in that time period (even when photographed with flash) This reversible color change occurs within a month, and we are using it as evidence that the corals have adapted to their lighting. Additional anecdotal evidence is accumulation as well. About 25% (6 colonies) of Galaxia under LED for 4 weeks now have entered an aggressive growth phase. This is indicated by the production of large sweeper tentacles that digest neighboring coral. None of the Galaxia (400 colonies) under VHO or Halide are showing sweepers. 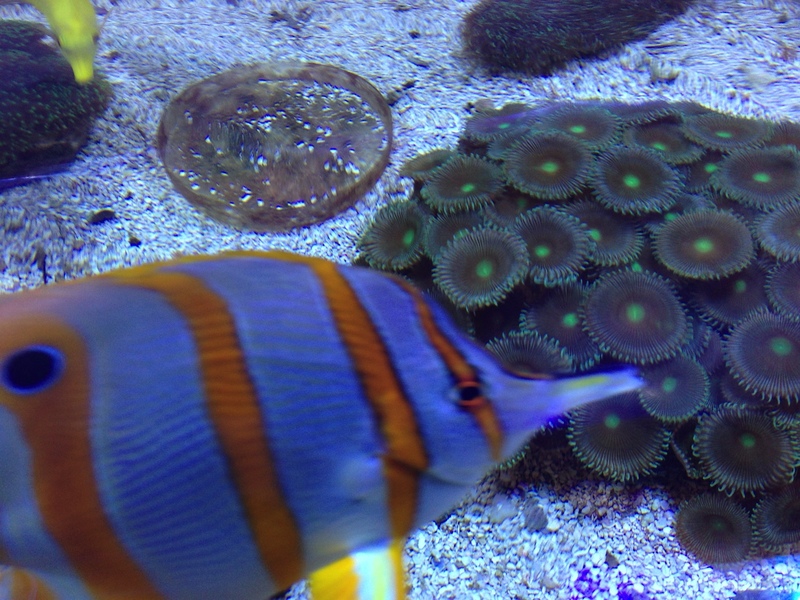 All of the corals are in the same water, at the same temperature and flow rate. Only the light is different. With respect to the photos, I am finding the color balance dramatically shifted toward violet. This produces an image that does not resemble the subjective evaluations my eyes provide. Have you obtained representative photos. Remember that our entire 2000 gal system is a collection of raceways; The water is less than 6 in deep and there is no viewing glass. 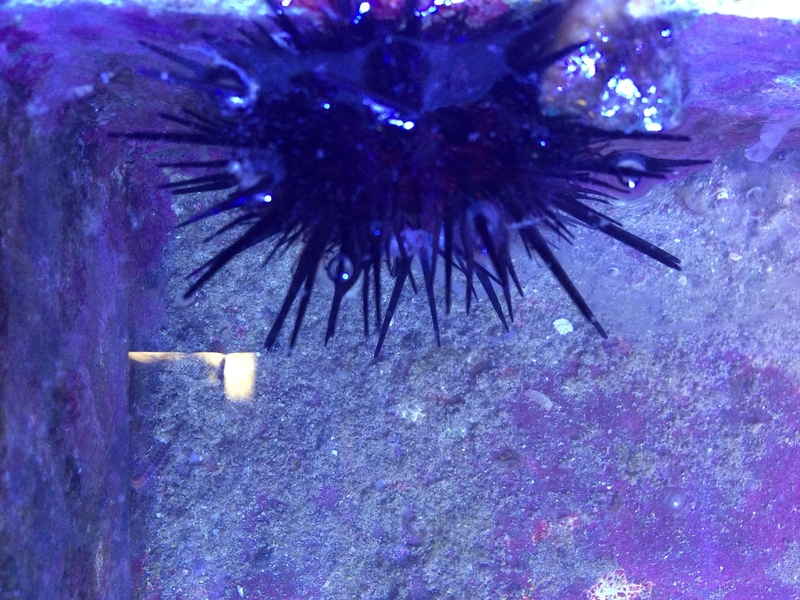 Included are a few urchin spawning shots and a Platythoa. And, so it Begins. How to Mount? Part of the challenge before experiments can even be ran is figuring out how to use all of the equipment to suit what needs to be done. The design of where all the corals are being watch is like a “raceway”. Not normal tank standards. These raceways a long and short. Figuring out how to mount any lighting over style of tank would be a challenge. Here’s what the guys at St. Mary College of Maryland figured out. The lamps are mounted on a PVC plate that is attached to J hooks. The J hooks are suspended from a pvc frame that is held by I beams above the tank. The lamps can be slid along the I beam or back and forth across the pvc frame or up and down by repositioning the j hooks. There are 8 units installed over the cloning facility and display tank as well as 8 units installed over the main research tank – 8 more tomorrow. Eight more over the holding tank next week. The display and cloning tank have been operational for several weeks now. Eight LEDs are replacing 8 175W 10,000 K Halides (two year old bulbs). The halides were delivering a Par of 39 and the LED’s 62 uM photons/M^2/sec. Anecdotally, all to the animals look better as fluorescence was dramatically enhanced by the increase in hight frequency light. Polyp extension appeared increased and color was more vibrant. Only one species (Sinularia) objected to the switch and required two weeks to acclimate to the lights. Meet the man, which has brought this whole study together. With government funding to upgrade the lighting in the biology research lab, he knew it was the right time to upgrade to one of the highest useful light LEDs on the market today. These science focused LEDs were the reason for the switch to the AquaRay LEDs. My research interests are in the areas of environmental physiology and chemical ecology of tropical marine invertebrates. My students and I are currently working on the chemistry and ecological significance of toxins produced by marine flatworms. We are also investigating the chemistry and ecological significance of molecular communication in soft corals and zooanthids. The organisms we work with produce other secondary metabolites as well including un described antibiotics and neurotransmitters. The projects in my lab, thus, lead to natural collaboration with Dr. Koch, Dr. Byrd, and Dr. Coughlin and their students working in the areas of natural product chemistry, microbiology, and neuro pharmacology respectively. In addition we also collaborate with Dr. Tanner on the chemical ecology of plant animal interactions. So, time to time, I post something that is work related onto my personal blog just because it is something that stands out to me personally. This time, I’ve decided to start a whole new blog, because this is going to be some on going excitement. One aspect I handle at work a lot is the idea of quality lighting for aquarium keeping. As interesting as this may sound…Cause, I’m sure it sounds awesome! This part of my work can be pretty amazing. Why, cause lighting is how we perceive so much in this world. We’re so visually driven (like 75% of our brain power at one time is managing what we are taking in visually), so for this reason, when you start to understand some aspects of lighting, some amazing things can happen. A little background. I work at American Aquarium Products of Southern Oregon. We’re a supplier of aquarium and pond products, but more importantly, we supply information on how to have the very best aquarium possible. This involves a lot of quality and experience. We push for ideas that make fish keeping, not just taking a fish and throwing it in some water, but provide an environment where the fish, plants, or corals can thrive under some of the best conditions. It sound difficult, but if it interests you to any degree, it simply fun. Long story short, I work with some of the best quality lighting there can be for fish, plants, corals, and even humans. We’re takin’ science here. This stuff is backed up by research, which has been proven for health and visual perception. These ideas I put into my little home aquarium, these are aspects and ideas, which many other people take very seriously. So, I work with some very smart professionals. So, what is the point of this blog? Just this past couple months, my work place had a very large inquiry of some lighting we supply, because of the excellence it provides. Let me remind anyone reading this post, we only sell what back up these high standards we set. We only sell what we have used with much success for a long period of time being in this industry. In other words, we don’t just sell what sells. We publish information based on science and facts, and back it up with an on-line store for anyone that is looking for these standards for this aquarium keeping adventure. So, a couple months ago, we had a college university acknowledge the work we have done, and make a very large order of the aquarium light emitting diodes (LEDs) for the study of growth rates in about 120 different species of corals. This is huge! LEDs are fairly new to the aquarium hobby for lighting of an aquarium. The basic idea behind this lighting and really is going to be the future of all lighting, like around the house, is that it uses a far less amounts of energy to operate and also, a color of light or a spectrum of light can be focused on to get only this spectrum of light to be shined from the light source. Again, this is huge when you know light feed plants and corals and if you can focus on the light that feeds them, and nothing else, you can have a very useful light source to make these living things thrive. This is what this university is focusing on and running controlled studies comparing the growth rate and health of coral species compare to older, but still very popular lighting methods (very high output fluorescence- VHO and Mental Halide- MH). This is also very exciting for human studies as well, because we know of lighting spectrum that improve human health as well (6500K daylight). So, since this is a new aspect in health, lighting, and aquarium keeping (and others). I thought it would be very valuable to publish their experiments and track their results. A little more background and how we go to this point. The LED lighting, which was purchase from us are called AAP AquaRay Lighting. This is a lighting brand that comes out of the UK, where much of our lighting comes over from China. The difference between these brands is that the AquaRay Lighting focus on few light sources with much more useful light energy for photosynthesis of plants and corals. Most of the current LEDs on the market for fish keeping are 120 watts each and will have something around 55 emitters in the fixture. The AquaRays LEDs, are 12-30 watts each and 6-10 emitters. With science you can prove these high PUR (useful light) fixtures can out perform any 120 watt LED and save an aquarium money in the long run. LEDs are meant to save money, that’s their kick anyways, but these AquaRays do it even better. For some reference, this college did the math and by making their switch from VHO and MH to AquaRay LEDs, they will be saving about $59,000 in just 10 years. The 120 watt LEDs use a lot more less useful light energy emitters to make up an overall successful light to grow whatever they would like. Please don’t take me wrong when I talk about these 120 watt LEDs. They can do the job, they are just not doing it the most efficient. So, I think enough words have been said for now. This blog is going to be a place to share the university’s results and any updates they provide to us. Hopefully at the end of all the experiments from the school year, we will have side by side evidence of how these LEDs compare to other lighting methods. I will say that these are the only LEDs like this on the market for aquarium keeping right now. They are miles ahead of some other fixtures out there right now. They even have patients on their emitters, so this blog should prove a little about the advancement of this technology. Enough of me talking, here is the start of the experiment, with all the information we know this far. Here are the experiment specs. They are interested only in growth rates. This research facility will be working with a total of 48 TMC AquaRay Ocean Blue 1500 LEDs.